wide enough for 8 modules. The New LC-A1216 is a Multifunction 12-channels actuator, Programmable with ETS to perform different tasks like switching loads, open and close shutters and blinds, drive valves operating in PWM and control 2 or 4 pipe fan coil. 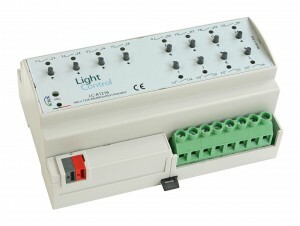 Each outputs uses bitable relays with 16A maximal load. Block terminals are very wide to insert wires with a section up to 5 mm2.